If you get to Cherry Creek and realize that you forgot your helmet, need a pair of Chacos, or are looking for a book on local flora and fauna, you are not completely out of luck. 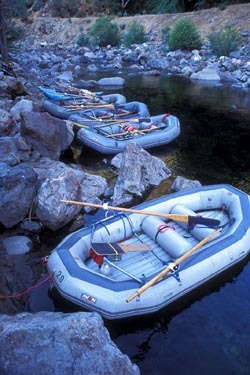 There are actually several options for buying river gear and camping equipment in the Tuolumne area. Mountain Sage – Outdoor gear (including rain coats and Chacos) and clothing are sold that is quaint store in a beautiful garden setting. They also have fair trade coffee, baked goods, and live music on weekends. Located in Groveland on Main Street (Hwy 120). (209) 962-4686. Sierra Nevada Adventure Co. (SNAC) – New and used mountaineering and paddling gear, plus books, maps, and technical equipment. Located at 173 S. Washington St. in downtown Sonora. (209) 532-5621. An overnight trip involves a lot of planning and logistics. Make sure you have an organized gear list and check it twice. Forgetting TP and coffee are two of the worst river trip faux pas you can make.